My eyes burn, my arms and wrists are ever so slightly feeling the ache. That's only because I just could not stop playing. Some would call the control scheme troubling, laborious or down right painful literally after any amount of play. Of course this is my first Wii game, so learning to use the controller took some getting used to, and again, that is only because I am not used to the Wii's unique control system. Though I can see why the game system can be appealing, it tends to make the player feel much more involved... I call it better than just button mashing in a certain sequence. Firefighting is hard and often dangerous work, for a game to even give a tiny bit of the experience, I say bravo. While of course this is a game and I am rather sure a rookie would not end up having to do so many different jobs with a fire company.. the game does give you a general taste of what these different jobs as a Fire fighter may be like. While there are what some may consider leaps from reality, (Again this is a game and a darn good tribute to the men and women Fire Fighters), winding up alone in parts of a burning building goes against both common sense and some of the training. So the game takes some leaps in the story line and of course a tribute and a fun game are perhaps hard to balance. Real Heroes Firefighter does a spectacular job at pleasing both criteria. While like any game that deals with limited subject matter or time, it can get repetitive in the actions performed, but the situations and when to use those skills are varied enough to keep it interesting. The tools of the trade are represented well here. Fire extinguisher, Hose with either stream or fog nozzle settings, the good ol fire ax, a halligan tool (that's a pry bar, used on doors or panels to pry them open. ), the Rotary saw, and the ever popular Hydraulic Spreaders (AKA jaws of life) these things make pretty short work of vehicles that one would need to get victims out of. Now across the industry we see the game getting classified as a first person shooter, granted your shooting streams of water instead of bullets...but first person shooter just does not cover it. It's a first person adventure experience. The basics of the story go that the player controlled character is a probie Fire fighter and is assigned to one of the busiest fire stations. Wouldn't you just know it? It's also one of the hottest summers on record, with no rain fall for some time, what could possibly happen? 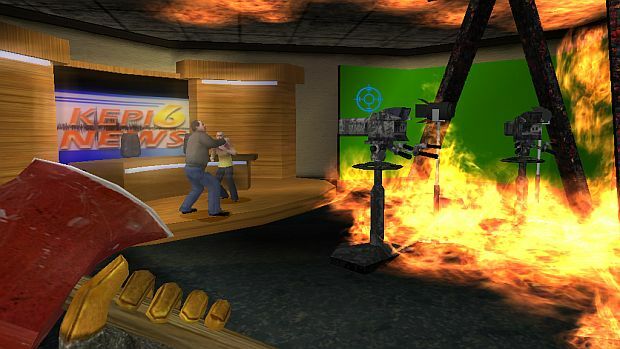 While the basic premise and some of the scripting can get a bit silly, (If I was being saved from a fire...the last thing I would be worried about is some guy owing me money), the game itself is actually pretty darn fun. I know the Wii by nature wants to please more on a family oriented game base, but I would have liked to see a more gritty story. Sure enough things soon HEAT up and the call out's are piling up with structure fires and on scene the player is tasked in fighting the fires, and also plenty of search and rescue. 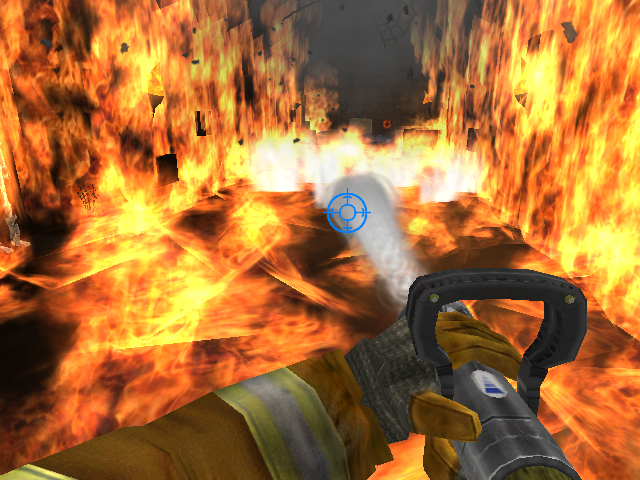 During these missions you end up using the various tools of the trade as mentioned earlier on, I am not sure if it's just because I am new to the Wii controls or some of the firefighting tools controls are as tough as they seem. Positioning aim points just right to get the desired results took some trying. Taking a break from time time from the game may be useful, or maybe I was just holding onto things too hard. Progression through some of the levels is hindered by some simple environmental puzzles. Electricity may be a danger in an area so finding the electrical box and shutting it down is what has to be done in order to proceed. Levels tend to be long and most of the tasks repetitive, get to any area, hose down the fire, and again, and again...but there are enough things thrown in to break this up a little bit thankfully. Again the missions and things that happen in the missions turn a little on the silly side at times. Saving roles of movie projector film seems rather goofy to me. Again, the action and the missions for the most part are engaging enough to keep you going, after all it's only a game. Knowing where to go level wise was pretty straight forward, just knowing what to do in the area to complete the objectives would not always be clear. The on screen reticle directs on where your going in the game, but it also changes when an object can be interacted with. From pushing objects on to reviving a victim and even carrying them. Graphics are pretty well done, while not a powerhouse of eye popping visuals, the explosions and other graphics levels and environments are all pretty solid and pleasing to the eye. Characters, and equipment animations are done well enough while the character animation are not as realistic and tend towards a repetitive motion animation, it does the job well. Graphics are clear and detailed enough to really sell it in this game world the game is depicting. Voice acting is nicely done, even with the sillier lines. While there is a nice well known cast, even the support voice cast does a good job at line delivery. The more well know actors who bring the characters to life for the game are listed here. James Marsters known more widely as “Spike” from TV series “Buffy the Vampire Slayer,” James Marsters plays Louis “Match” Morris, the veteran who has seen-it-all tough guy. Had the pleasure of meeting Marsters years ago during his Buffy the Vampire Slayer days, surprisingly well mannered man, and hearing his actual voice you get a true sense of the talent he and these other actors bring to any project. Michael Jace known as Officer Julien Lowe from the hit TV series, “The Shield,” he is voicing Lt. Dylan Scott, the second-in-command of the player’s fire station. Jamie Kennedy a popular comedian and actor, Kennedy is.. surprise there,the game’s comic relief as Marc “Cam” Cameron, a younger firefighter. Jenette Goldstein fans may know as her role as Private Vasquez in the classic film “Aliens,” She plays Esmerelda “Ezzy” Vasquez, a tough lady firefighter. Jack McGee seems to like firefighting films because he has been in “Backdraft” and “Rescue Me,” McGee voices Ed Martin, the veteran Engineer of the firefighting team. John Di Maggio gamers will know voices alot of characters, best known for Bender from “Futurama,” and Marcus Fenix in “Gears of War”, Di Maggio voices Captain Tomihiro Kotaka, the leader of the squad. The one character in the game that is actually in the title, though you may not think of as a character...is very well depicted in the game. The fire itself, is almost like a living thing. From explosions and burning debris knocking into other items and setting them alight. It crawls across the ceilings, eating burnable items and sucking up precious oxygen. If not for some of the silly predicaments that take place, the fire scenes could be down right scary. Worth a look, worth having in your collection for several reasons. 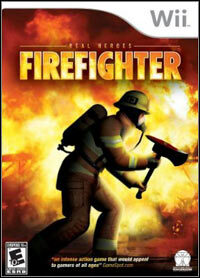 The game delivers enough Fire fighting action to keep it engaging, repetitive or not. Two of the founders of Epicenter Studios, creators of Real Heroes Firefighter, worked on the Call Of Duty Franchise...so the talented designers shine through on this title. The balance of action, but with no violence is a tough tight rope to walk, but pulls it off, so Real Heroes Firefighter is family friendly. While not a feature of the game, it can make you feel good to know that a portion from the game sale is donated back to The Firefighter Cancer Support Network. Will this title be a series franchise? Time will tell. If so, some of the things we would like to see is another more grittier version, maybe a little more control for the player to control a squad, work your way up command and have the ability to know what it's like to have the burden of being the commander on site and controlling several Fire Houses on scene. Maybe even move into other areas and professions. Maybe expand...Police officer, being on a shift as a patrol officer opens up a lot of potential. In a nut shell folks. Real Heroes Fire Fighter sparks the imagination and the appreciation of what these men and women do. Repetitive and silly at times, it's still a fun game that throws a few curves here and there in it's situations. This game is one of those, you will either really like it, or your really gonna hate it.